As 5G networks become a reality in 2019 and 2020, the new standard will further increase the appeal of cellular solutions in the areas where it's available. And, as 5G-supported hardware rolls out, companies can use the network to support their IoT business. But the excitement around 5G doesn't mean it should be selected above all other options whenever available. In fact, in some cases, it's not even the best among cellular solutions. Companies that use IoT devices and providers of IoT-based services and solutions need to be discerning in their determinations of where 5G will help and where it won't. 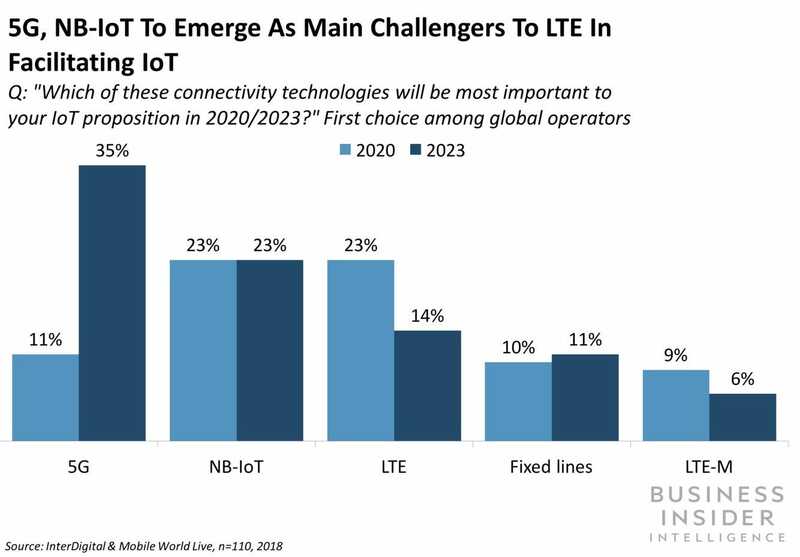 In The 5G and The IoT Report, Business Insider Intelligence will examine how the introduction of 5G is poised to transform portions of the IoT ecosystem. First, we look at the 5G standard broadly, identifying its strengths and weaknesses in comparison with existing standards, as well as laying out the timeline for rollout and expectations within the wireless industry. Next, we look at the new practices that 5G will enable in the IoT, focusing specifically on the capacity for high-bandwidth remote analytics, as well as the ability to use remote processing centers for mission-critical services. Finally, we examine areas where 5G will leave gaps and how companies will need to cope with the standards’ early limitations. The companies mentioned in this report are: AT&T, Ericsson, FairCom, InterDigital, Motorola, Nvidia, Qualcomm, Quectel, Sierra Wireless, Telstra, Verizon, and ZTE.